Please refer to our stock # W-FIG29 when inquiring. 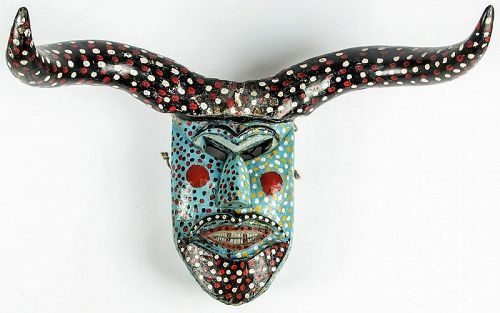 In the Mexican state of Michoacan, where this mask originates, there are dancers who are variously called los Diablos (devils), los Judíos (Judas’), or los Fariseos (Pharisees). These dancers may wear many different masks—devils, menacing or evil characters, skulls, animals, and human faces which imitate the persecutors of Christ - during Semana Santa, or Holy Week. This large, fantastic Mexican Baltazar Holy Week dance mask is fashioned from real horn and carved wood, and brightly painted with a blue face, black horns and multicolored dots. Condition is good with normal wear for a vintage mask. PROVENANCE: Bob Brand and Liz Werthan, Philadelphia. DIMENSIONS: 21" H x 31" W x 19" D (53 x 79 x 48 cm).